with a great deal of care and thought to provide a place to record one’s life, personal feelings, memories, and wishes for the ultimate distribution of personal belongings. 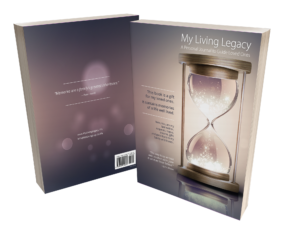 It is an informal supplement to your Will and Trust, an easy to use template and tool to help you discover the inner you. It will give you peace of mind and provide your family and friends with all of the information they would want and need. This will become a treasure chest of your life experiences. Write in it as you would a journal or diary, making changes as needed. Embellish it with articles and pictures. Whatever you make of it, it will be cherished in the hearts of those you leave behind. That’s a promise! Think about giving this to your family members as a gift too!